Spectroscopy is the main branch of analytical chemistry which mainly deals with the study of concentration of analyte as the function of amount of radiation absorbed if electromagnetic radiation from suitable source is directed at it. Spectroscopy is as well stated as a process of analysis that comprises the measurements of the intensity and wavelength of radiation which is either absorbed or transmitted. What you require to understand from both definitions is that, if electromagnetic radiation passes via a solution of a compound (or sample), some amount of light radiation is absorbed via the molecules. According to the Beer's law, amount of radiation absorbed via the molecule in solution is proportional to the number of absorbing molecules in the solution (or concentration). The absorbed radiation brings about diminish in the intensity of the transmitted (or unabsorbed) radiation. The more the number of absorbing molecules (or concentration), the greater the intensity of absorption. Spectroscopic methods can be employed in the determination of the concentration (or quantitative analysis) of an analyte and in the recognition (or qualitative analysis) of an analyte. The instruments employed to study or measure the absorption or emission of electromagnetic radiation as the function of wavelength is termed as spectrometers or spectrophotometers. Electromagnetic radiation covers a long range of radiations that are broken down to various regions according to wavelength. The Ultraviolet (UV) region extends from around 10 to 380 nm, however the most analytical helpful region is from 200 to 380nm, termed as the near ultraviolet region. Beneath 200 nm, the air absorbs noticeably and therefore the instruments are operated under a vacuum; therefore, this wavelength region is termed as the vacuum ultraviolet region. The visible region is the region of wavelengths which can be seen through the eye, which is, the light appears as a colour. This extends from the near ultraviolet region (that is, 380 nm) to around 780 nm. Whenever an organic molecule absorbs UV- visible radiation, the energy from UV or visible light causes the outer electrons from the lower energy to be increased to a higher energy level, corresponding to the electronic transition. This transition of electrons is from molecular bonding orbital to the higher energy antibonding molecular orbital. According to the molecular orbital theory, the shared electron pair of a covalently bonded atom might be thought of as occupying molecular orbitals (or simply MO) which is of a lower energy and consists of corresponding unoccupied orbitals termed as antibonding molecular orbitals; such correspond to excited state energy levels (that is, higher energy level). If the molecule is in the ground state, both electrons are paired in the lower-energy bonding orbital - this is the Highest Occupied Molecular Orbital (or simply HOMO). The antibonding, in turn, is the Lowest Unoccupied Molecular Orbital (or simply LUMO). Whenever organic molecules which are capable of absorbing UV visible radiation (that is, chromophores) are exposed to the radiation at a wavelength having energy equivalent to the difference between the energy of the HOMO and LUMO (having energy equivalent to ΔE, the HOMO-LUMO energy gap) this wavelength will be absorbed and the energy employed to bump one of the electrons from the HOMO to the LUMO. The energy absorbed appears as absorption peaks at the wavelength it corresponds to on the UV -Visible spectrum. The amount of absorption of electromagnetic radiation corresponds to the concentration of the analyte via the application of Beer-Lambert law. Molecules having pi electrons or non-bonding electrons can absorb the energy in the form of ultraviolet or visible light to excite such electrons to higher anti- bonding molecular orbitals. The more simply excited electrons (that is, lower energy gap between the HOMO and LUMO) the longer the wavelength of light it can absorb. Not all the molecules absorb UV-visible radiation. If the energy gap between the HOMO and LUMO is large absorption will not occur, however if this energy gap is small absorption will occur. The electronic transitions that occur in the visible and ultraviolet regions of the electromagnetic radiation are because of absorption of radiation by particular kinds or groups, bonds, and functional groups in the molecule, termed as chromophores. Such have valence electrons of low excitation energy. The electron of a saturated compound in a bonding σ orbital is excited to the respective antibonding orbital σ*. The energy needed is huge. The high excitation energy makes it not capable to contribute to absorption in the visible or UV regions. For illustration, methane (that consists of only C-H bonds, and can just undergo σ → σ* Transitions) exhibits an absorbance maximum at 125 nm. Absorption maxima because of σ → σ* transitions are not seen in usual UV-Vis. spectra (200 - 700 nm). The saturated compounds having atoms having lone pairs (that is, non-bonding electrons) are capable of n → σ* transitions. Such transitions generally require less energy than σ → σ* transitions since the non bonding electrons are less tightly held as compare to sigma electrons, though, the energy gap between the HOMO and LUMO is large. n → σ* transitions take place at wavelengths less than 200nm.The number of organic functional groups having n → σ* peaks in the UV region is small. Unsaturated compounds having atoms with lone pairs (that is, non-bonding electrons) are capable of n → Π* transition. The non-bonding electrons are less tightly held, they can be excited through visible or UV radiation to unoccupied pi antibonding orbital (Π*). Electrons in pi orbitals of an unsaturated compound are mainly responsible for Π → Π* Transitions. They are the most readily excited and accountable for a majority of electronic spectra in the visible and UV regions. It is significant to illustrate at this point that, most of the absorption spectroscopy of organic compounds is mainly based on transitions of n or Π electrons to the Π* excited state. This is due to the absorption peaks for such transitions fall in an experimentally convenient region of the spectrum (200 to 700 nm). The energy gap between the HOMO and LUMO is very small. Usually the compounds which absorb strongly UV-visible radiation are molecules having conjugated pi systems (that is, compounds having more than one double bond, alternating a single bond). In such group, the energy gap for Π → Π* transitions is smaller than for isolated double bonds, and therefore the wavelength absorbed is longer. Molar absorptivity from n → Π* transitions are comparatively low, and range from 10 - 100 L mol-1 cm-1. Π → Π* transitions generally provide molar absorptivity between 1000 and 10,000 L mol-1 cm-1. Most of the inorganic species exhibit charge-transfer absorption and are termed as charge-transfer complexes. For a complex to illustrate charge-transfer behavior one of its components should have electron donating properties and the other component should be capable to accept electrons. The absorption of radiation then comprises the transfer of an electron from the donor to an orbital related by the acceptor. The intense colour of metal chelates is often because of the charge transfer transitions. This is simply the movement of electrons from the metal ion to the ligand or vice-versa. These transitions comprise promotion of electrons from Π levels in the ligand or from σ bonding orbitals to the unoccupied orbitals of the metal ion or promotion of σ bonded electrons to unoccupied Π orbitals of the ligand. Whenever such transitions take place, a redox reaction in fact takes place between the metal ion and the ligand. Generally, the metal ion is reduced and the ligand is oxidized, and the wavelength (that is, energy) of maximum absorption is associated to the ease by which the exchange takes place. Molar absorptivity from charge-transfer absorption are huge (greater that 10,000 L mol-1 cm-1). 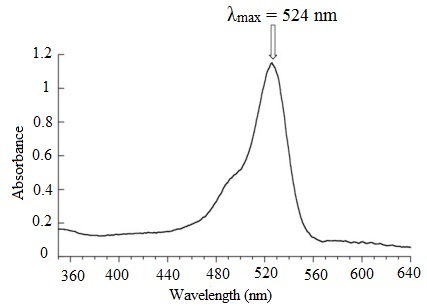 A) UV-Vis spectroscopy is regularly employed in the analytical chemistry for the quantitative determination of various analyte, like highly conjugated organic compounds, transition metal ions and the biological macromolecules. B) UV-Vis spectroscopy can be employed to find out the concentration of an analyte in a solution. This is mainly based on Beer-Lambert law. The law is just an application of the observation that, in certain ranges, the absorbance of a chromophore at a particular wavelength differs in a linear fashion having its concentration: the higher the concentration of the molecule, the bigger its absorbance. If we divide the observed value of A at λmax via the concentration of the sample (c, in mol/L), we get the molar absorptivity, or extinction coefficient (ε) that is a characteristic value for a particular compound. (C) The wavelengths of absorption peaks can be associated by the kinds of bonds in a particular molecule and are valuable in finding out the functional groups in a molecule. The absorption of light radiation via solutions can be explained by a combination of laws of Beer and Lambert. Such two laws relate the absorption to concentration and to the thickness of the absorbing layer correspondingly. Beer's law defines that the absorption of light is directly proportional to the number of the absorbing molecules. That is, the transmittance reduces exponentially by the number or concentration of the absorbing molecules. Lambert's law defines that similar proportion of incident light is absorbed per unit thickness irrespective of its intensity, and that each and every successive unit layer absorbs the similar proportion of light falling on it. For illustration, if the incident light is 100% and 50% of it is absorbed per unit layer, the intensity of light will reduce exponentially as follows: 50%, 25%, 12.5%, 6.25% and so on. Here, 'k' is a constant and 'l' is the path length. Here, 'ε' is a constant termed as molar extinction coefficient (or molar absorptivity) that is numerically equivalent to the absorbance of a molar solution in a cell of 1cm path length. Note: Since Lambert's law holds for all cases, Beer's law just obeyed via dilute solutions. The absorbance (A) is the measure of fraction of light radiation which is absorbed through a given sample solution, whereas transmittance (T) is the fraction of incident light which is not absorbed (that is, transmitted via the solution). Transmittance is often deduced as a percentage known as percent transmittance. It will be noted that as the absorbance of a solution rises, the transmittance reduces. The absorbance Log10 (Io/I) is measured via a spectrometer or spectrophotometer. If you are familiar with the molar absorptivity of a solution at a specific wavelength, and you measure the absorbance of solution at that wavelength, it is simple to compute the concentration. The mere other variable in the expression above is the length of the solution. That is simple to measure and, however, the cell having the solution might well have been manufactured by a known length of 1 cm (most of the cells are manufactured by a known length of 1 cm). For illustration, let us assume that we have a solution in a cell of length 1 cm. We assess the absorbance of the solution at a specific wavelength by employing a spectrometer. The value is 1.92. We will find out a value for molar absorptivity in a table of 19400 for that wavelength. This method, obviously, depends on you having access to the accurate value of molar absorptivity. It as well supposes that the Beer-Lambert Law works over the entire concentration range. This is much better to evaluate the concentration via plotting a calibration curve. In making the calibration curve, this is imperative to recognize the wavelength at which the absorbance of the various standard solutions and the sample solution is to be recognized. The wavelength is found out by plotting absorbance against the wavelength (evaluated in nanometers). The wavelength consequent to the absorbance maximum (or transmittance minimum) is read from the plot and utilized to make the calibration curve. Let us take an illustration. Assume that you are asked to make a calibration curve to find out the concentration of a sample whose concentration is unknown via UV- Visible spectroscopic process. What you will do to find out the wavelength at which this find out is to be carried out is to make a standard solution of the sample, after which you evaluate the absorbance and percentage transmittance over a series of wavelengths example: wavelengths covering the range 360nm to 640 nm at for example 10nm intervals that is, 360nm, 370nm, 380nm and so on. Plot the graph of absorbance against the wavelength or percentage transmittance. We would acquire a graph as illustrated in the figure below. The λmax of 524 nm is the wavelength of maximum absorption therefore the calibration curve will be found out at this wavelength. Doing it this manner you do not have to depend on a value of molar absorptivity, the reliability of the Beer-Lambert Law, or even know the dimensions of the cell having the solution. What you do is to make up a number of solutions of the compound we are investigating each of precisely acknowledged concentration. Such concentrations must bracket the concentration you are trying to determine - some less concentrated; a few more concentrated. For each solution, we measure the absorbance at the wavelength of maximum absorption - by using the similar vessel for each one. Then we plot a graph of absorbance against the concentration. This is known as calibration curve. According to the Beer-Lambert Law, absorbance is proportional to the concentration, and therefore you would anticipate a straight line. That is correct as long as the solutions are dilute, however the Law breaks down for solutions of higher concentration, and therefore we might get a curve under such conditions. As long as we are working from values either side of the one you are trying to find out, that is not a problem. Whenever we compared the peaks on a particular UV-visible absorption spectrum by a list of known peaks, it would be fairly simple to pick out a few structural features of an unknown molecule. The lists of known peaks often comprise molar absorptivity values too. That might assist you to be even surer. For illustration: By using the simple carbon-oxygen double bond of ethanal (CH3CHO) which consists of two peaks in its spectrum at 180 and 290nm, data exhibits that the peak at 290 consists of a molar absorptivity of just 15, compared by the one at 180 of 10000. If your spectrum exhibited a very large peak at 180, and an extremely small one at 290, that simply adds to your certainty. Radiation or light source: A light source generates a polychromatic beam of light. The UV-Visible spectrophotometer employs deuterium, tungsten halogen or xenon lamps or LED as the light source. The deuterium arc lamps measure in the ultraviolet (UV) region 190 to 370 nm. Tungsten halogen as well termed as quartz iodine lamp evaluate in the visible region from 320 to 1100nm. Xenon lamp assess in both the UV and visible regions of the electromagnetic spectrum from 190 to 1100nm. Monochromator: It is a device that is employed to resolve the polychromatic radiation to its individual wavelength and isolates such wavelengths to a very narrow band. Such device generates light radiation of only particular (single) wavelength. Here, the Monochromator chooses a specific wavelength for the incident beam of light (Io). Sample cell or cuvette: It is the container which holds the sample to be analyzed. Detector: It evaluates the intensity of the transmitted light (I). Meter: The readout is supplied through a meter. The sample is put in the cuvette and is then irradiated by an incident beam of light (Io) of a particular wavelength. A detector then evaluates the amount of light which is transmitted via the sample (I). The signal from the detector drives a meter which can be calibrated to read the transmittance or absorbance. To make use of the UV-Visible spectrophotometer, the calibration method involves setting 0. Absorbance at a particular wavelength with a cuvette having a reference or blank solution. Usually, the blank solution is just the solvent, that is, the cuvette is filled by only the solvent employed to dissolve the sample to be examined and inserted to the cell holder of the spectrophotometer. Zero (0) absorbance is pressed on the spectrophotometer to set the blank at 0. After this, the blank is eliminated and a similar cuvette having the solution of interest is then inserted to the spectrometer, and the absorbance is read from the meter on the instrument. Both the calibration and reading should be done at the similar wavelength. The reading for the solution then symbolizes the absorbance at the selected wavelength because of the component of interest. The calibration has accounted for some absorption (or reflection or scattering) of light through the cuvette and other species in the reference solution.